A classic very challenging traverse of the Highlands and its wilder and remoter landscapes. 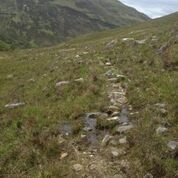 Initially following the Great Glen, the route turns north to cross Glen Garry, Glen Loyne and Glenshiel before crossing the wilderness to Strathcarron, continuing north through Torridon, Dundonnell (ferry) and Ullapool, where the coast is followed to Cullnacraig. The Coigach and Assynt Hills are traversed followed by the high moorland to Achfary and then via Foinaven, Rhiconich, Kinlochbervie and Sandwood Bay to the finish. The 'North to the Cape' publication (202 miles) follows a similar route in connecting the extremities.